“Thee” was used in the 19th century and is old German for the word “tea”. This Theehandlung is basically a shop where tea lovers like me stock up on their supplies. I’m stressing the expression ‘lovers’ here since the shop covers not only a great range of teas from all over the world but also tea sets, honey with various flavors, cookies and everything else you can think of that would go well with the infused drink. Every week you can savor five different blends. 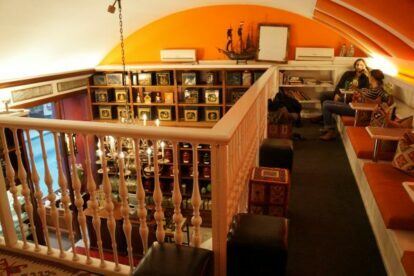 Besides all the equipment to make your private tea party a perfect one, this spot also has a small yet lovely gallery upstairs which fits eleven people at maximum. It is so cozy sitting above the heads of other customers, listening to the salespersons (with their typical Austrian accent) explaining all the do’s and don’ts and giving shoppers tips on how to brew every particular type of tea. Also, gazing out on the street at a plethora of passengers or the bus driving by on narrow Wollzeile is better than watching TV.